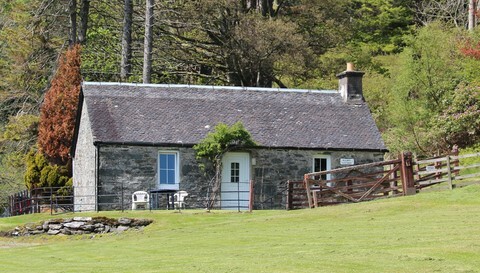 Ellary Cottage is one of the oldest on the estate, and has thick stone walls making it very cosy. It is popular with couples or young families. The accommodation is all on one level and features a generous living room with dining area and open fire, large double bedroom with views out to the loch, modern kitchen with washing machine, bathroom with bath (no shower), and a bunk room with full sized single bunks. The fenced garden wraps around the front of the property, and is the ideal place to sit and enjoy a book. It is close to the harbour, so ideal for boat owners.